The theater was the Lyric, situated in the middle of a row of six theaters on the north side of 42nd Street between 7th and 8th Avenues, the famous “Deuce” of New York legend. 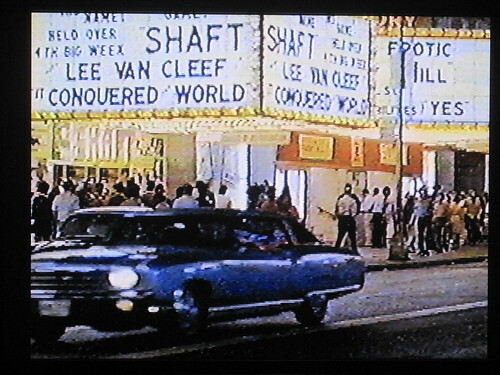 SHAFT had opened in New York on July 2 at the DeMille Theater on Broadway and 47th Street, but I don’t know at what point in its run it started playing at the Lyric. The marquee in that picture says “Held Over 4th Big Week,” but I couldn’t say whether that was in July, August or September. 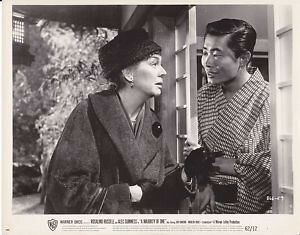 When I began my research into Asian stars appearing in TV westerns (see my entry of Jan. 8, 2013), it took me a while to get to Anna May Wong because I didn’t associate her with TV appearances in the 1950s and ’60s the way I did with a younger generation of Asian actresses such as Lisa Lu, Nobu McCarthy, Nancy Kwan, France Nuyen, and Miyoshi Umeki. 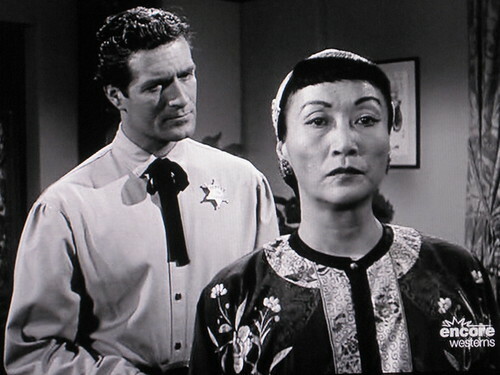 But eventually I did and I was happy to learn that she’d appeared in an episode of “The Life and Legend of Wyatt Earp” that was called “China Mary” and aired on March 15, 1960. Since the Encore Western Channel runs this series, I hoped it was only a matter of time before I could see it, so I checked the listings every day to see what episodes they would run and after a year or so of waiting, it came on this past Monday, August 19. Luckily, I had the day off and was able to watch it and take screen grabs, as well as record it. Rhonda Fleming turns 90 today, August 10, 2013. It gives me an opportunity to pay tribute to someone who is still, happily, with us. Fleming acted regularly from 1943 to 1980, with one more credit in 1990. She was one of the Technicolor Queens of the 1950s, along with two other redheads, Maureen O’Hara and Arlene Dahl (both of whom are also still with us, as of this writing), and she acted in a great run of westerns, crime dramas, globetrotting adventure films, swashbucklers, comedies, and film noir. She was a particular favorite of the Paramount-based Pine-Thomas production team—William H. Pine and William C. Thomas, collectively known as the Dollar Bills because of their skill at squeezing the most production value out of a dollar—and starred in several of their adventure films set in third world countries, with such titles as CROSSWINDS, HONG KONG, TROPIC ZONE, and JIVARO. (O’Hara and Dahl also worked for Pine-Thomas, but not as often as Fleming.) Her co-star in three of these films was Ronald Reagan. She’s particularly good in the Universal costume adventure, YANKEE PASHA (1954), in which she played Yankee pioneer Jeff Chandler’s New England girlfriend who gets kidnapped while on her way to France by Barbary Pirates and sold into Lee J. Cobb’s harem in Tripoli, ca. 1805, and has a catfight with her fellow harem girl, Mamie Van Doren(!). 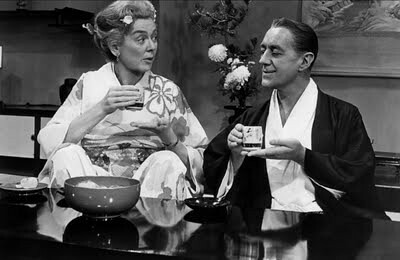 She even co-stars with Dahl in the James M. Cain adaptation, SLIGHTLY SCARLET (1955), giving us two redheaded divas for the price of one, a film I wrote about here on May 28, 2012, on the occasion of the centennial of the film’s male lead, John Payne. Turner Classic Movies was running A MAJORITY OF ONE (1961) earlier today and I just happened to come across it in the middle. 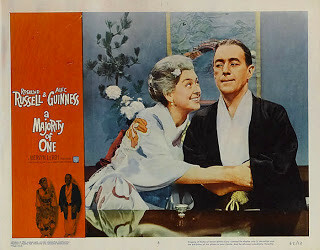 In the film, Alec Guinness, under heavy makeup, plays a widowed Japanese man who has a relationship with a middle-aged American Jewish woman played by Rosalind Russell. 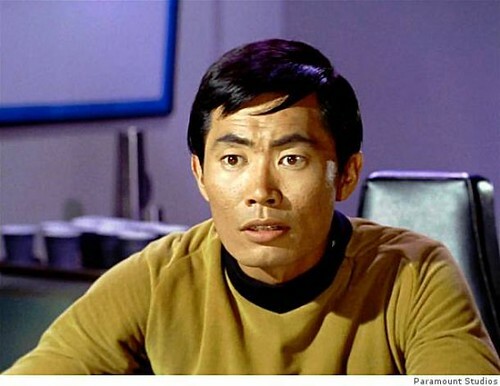 Takei, of course, went on to play Sulu, the helmsman on board the U.S. Starship Enterprise, on the original “Star Trek” TV series, as well as six subsquent Star Trek movies. 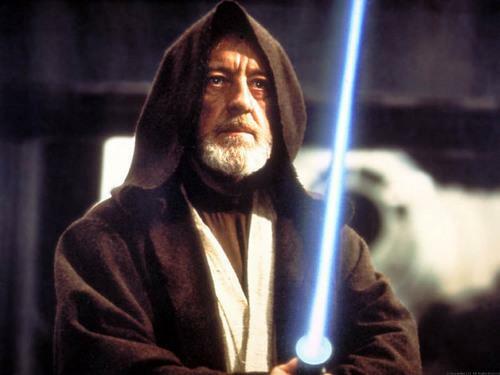 Guinness, of course, went on to play Obi-Wan Kenobi, the famed Jedi Knight in STAR WARS (1977). So who else knew that Sulu was the son of Obi-Wan Kenobi?